The Xgard range offers a comprehensive selection of fixed point gas detectors that meet the diverse requirements gas detection in industries throughout the world. Intrinsically Safe (I.S.) or Flameproof (Exd) versions are available for a wide range of applications. Xsafe is a cost effective solution for flammable gas detection in safe areas such as boiler rooms, kitchens and commercial buildings. Xgard detectors are designed for easy installation and maintenance to keep costs down. The three junction box options are all designed to make replacement of sensors and sinters extremely simple. Xgard Types 1 and 2 utilise oxygen sensors with a 2- year life-span, so sensor replacement costs are halved when compared to conventional oxygen detectors. Many spare parts are common to all Xgard models, which keeps spares holding requirements to a minimum. Xgard is designed for either wall or ceiling mounting without the need for additional brackets. Xgard can accommodate M20, 1/2" NPT or 3/4" NPT cable glands to suit all site requirements. High temperature models are available for hot environments (up to 150oC). Accessories are available for duct mounting, and sampling applications as well as remote gassing for simple sensor checking. 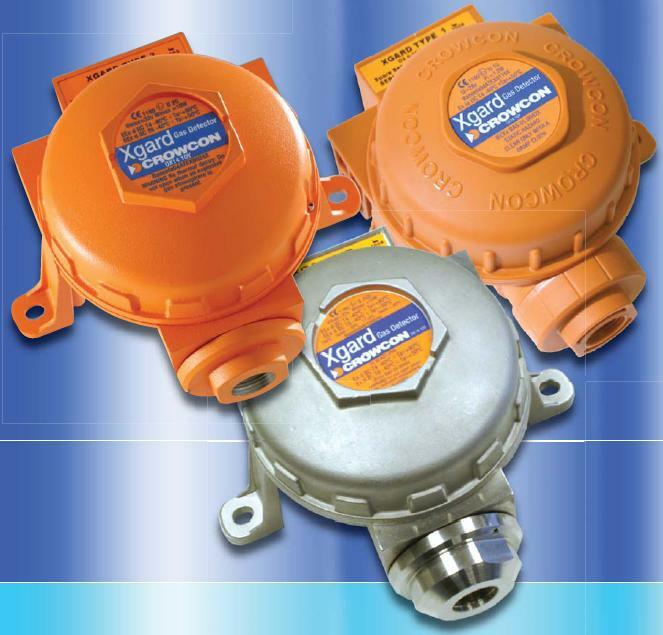 Xgard offers an extremely wide range of sensors for all applications. Poison resistant pellistors, for all flammable detection needs including hydrocarbons, hydrogen, ammonia, jet fuel, leaded petrol and vapours containing halogens. Electrochemical sensors are used to detect a vast range of toxic gases and oxygen. Thermal conductivity sensors are available to monitor volume concentrations of gases. Xgard is manufactured using a choice of three materials: glass reinforced nylon, highly durable aluminium with a tough polyester coating, or 316 stainless steel for ultimate corrosion resistance. All versions are designed to operate even in the harshest conditions. Spray deflectors and weatherproof caps are available for use in areas subject to regular wash-downs, or offshore environments. S011954	0-100% LEL methane plus general flammable gases. Supplied with bonded sensor retainer and Viton o-ring. M04909	Sensor retainer O-ring. Viton. M04910	Junction box lid O-ring. Viton. E07688	High temperature terminal block. S011238/2	10: Amplifier PCB for the following gas types: carbon monoxide, chlorine dioxide, hydrogen, hydrogen sulphide, nitrogen dioxide, sulphur dioxide. Types 1 & 2 only. S011896/2	10: Amplifier PCB for the following gas types: ammonia, arsine, bromine, chlorine (2008 onwards) diborane, ETO, fluorine, germane, hydrogen cyanide, HCL, hydrogen fluoride, nitric oxide, ozone, phosgene, phosphine, silane. Type 1 only. M04972	12: I.S. PCB cover† Type 1 only, required in addition to M04770 PCB cover. S011819/2	11: Sensor module PCB with no gain resistors. Resistors must be fitted to suit the gas sensor and range.